Once formed as Murder Therapy, Nero Di Marte’s constant evolution into extreme and experimental technics comes to its peak with this nameless full length. There are six tracks on the recording, yet the whole lasts for forty eight minutes, so expect no easy-listening effort. The new stuff was recorded with Michele Trasforini (Regrexion Studio) and mixed and mastered by famous producer Riccardo Pasini aka Paso at Studio 73 (Ephel Duath, Slowmotion Apocalypse, Subhuman, Conspiracy, Handful Of Hate and many more). 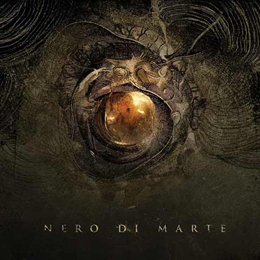 In comparison to Murder Therapy, Nero Di Marte sounds less Americanised; the comparisons to the likes of, for example, Dying Fetus or Cannibal Corpse evolved into a more modernised, progressive and atmospheric approach. However, the inherent extremity has not gone. The tracks are brought with lots of variation, sudden breaks, technical experiments and stylistically well-thought constructions. One cannot call this stuff ‘Death Metal’ anymore, for the progression into a more complex totality is of undeniable importance. It’s catchier and groovier, yet extremely difficult to digest as well. That, of course, has to do with the long average duration of the songs too (in between six and twelve minutes). A recommendation if you can appreciate material in the vein of, let’s say, Strapping Young Lad, Gojira, Periphery or The Ocean.